So much has been said about skincare among women. There are the organic ones and there are also the medical ones. But whatever they are, there are already ways, ancient ways that are proven to be effective and helpful in bringing out the youthful glow in our face. Yes, they’ve worked with women during the old times. And up to now, they are still working. Some are even reliable and dependent with those practices. See the list from below if you want to check it out. Eggs. Oh yeah, you have them for breakfast, you might as well have them applied in your face before you sleep at night. Eggs had that special quality that can tighten up the wrinkles and creases in your face. History records would tell that Zhang Lihua was the one who kept that ancient skincare secret during the Chen Dynasty. She was known to be a renowned beauty and Imperial Consort on the said regime. Eggs were considered to be an instant face lift. Even Queen Elizabeth I liked that skin treatment so much. It’s one of her favorite face pamper sessions. Anti-aging gloves. Hands are considered to show the first signs of aging. Yes, you can see the wrinkles and creases in it. But all thanks to our shopaholic French queen named Marie Antoinette. She devised a fashionable alternative to conceal that skin blunder in our hands. Anti-aging gloves emerged during her grandiose reign. And as vain as she was, she would wear gloves that are packed with wax, rose water and sweet almond oil every night to smoothen out her skin. Up to now, this item is still widely used by most women. It’s even available in the market. Crocodile dung. This seemed like gross. But it’s really effective! Even Greeks on the ancient times would use this kind of skincare treatment. They would soak themselves with crocodile mud with the belief that it can slow off the aging process. It’s kind of similar with the bird poop facial treatment you will see on the Fitgrabber blog. But there’s truth and validity behind that gross skincare treatment! Be thankful that it comes with a better modification. Crocodile excrement are now mixed up with honey and sodium bicarbonate. Milk and Honey. Cleopatra is known to have a beautiful and flawless skin. She had a lot of beauty secrets, you are aware of that thing. And one of it would include her grandiose baths that includes honey, milk and olive oil. And it is proven effective since that it’s one of the services offered in several exclusive spas in all parts of the world. So the next that you are in a rush to have a quick fix of your dear plump skin, head straight to your fridge or pantry. Rose water. 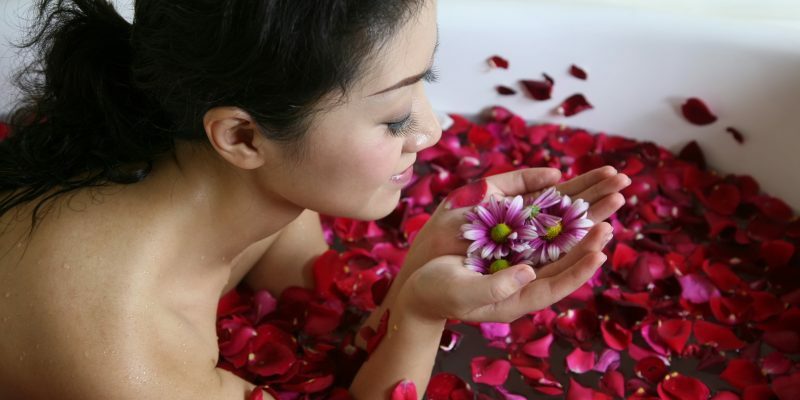 Rose water treatments is usually offered in spas. It’s also one good way of clearing out the dirt and tightening up your pores. But little did you know that these skincare hack is already practiced way back from the ancient Egypt. Most women used it as a cleanser since it performs best in ridding out the pollutants covering and dominating your skin.